This tool allows you to perform comparisons between directories, and reports, new, updated, renamed, moved and deleted files. It can be useful for differential or full backups. This path is considered to hold your original files, and never gets updated by the "synchronization" function. This path is considered by the program to hold copies of your files. New files or files that have been updated are copied in this path. Green: Updated file. File on the left side was updated. Column age difference shows the difference in the most suitable friendly format. Blue: New file. 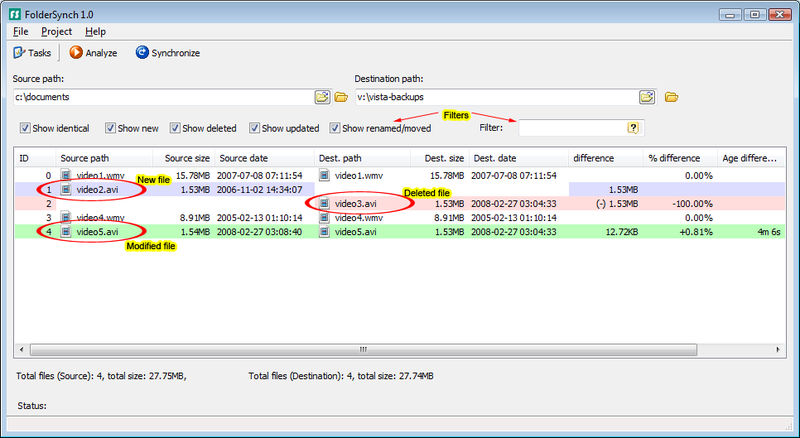 The file does not exist in the destination path. White: Identical file. File has not been updated. f) It also supports filtering by keyword. To filter by keyword, simply type your keyword in the filter box at the top of the screen. All these filters can be applied simultaneously. For example you can to filter only "new files" that contain the keyword "mp3"
By pressing the "Synchronize" button, a script that could perform all listed changes into the destination path, is generated. If you have a filter applied, the script will only include the filtered files. So regardless of the total changes between the right and left paths, only visible files will be included in the script. This function allows you to store sets of directories so that you can review differences by simply selecting an entry from these tasks. To view the tasks, press "Tasks" from the top toolbar. 950 2,649 Saleen Software <img src="https://www.oldergeeks.com/downloads/gallery/thumbs/FolderSync1_th.png"border="0"> Apr 14, 2019 - 11:57 1.0.0.219 7.86MB EXE , out of 11 Votes.